"My joinery side was the basis of where my construction knowledge began. The sky’s the limit really and the foundations came from Derby College." Joe Evans, 28, from Belper, now leads a team of 10 and his work covers an area stretching from Chesterfield down to Milton Keynes. 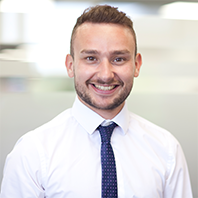 Joe joined Avant from Barratt Homes, where he was a senior quantity surveyor, having started there as a joinery apprentice on day release at Derby College. He switched to the National Certificate in Construction, while working as a trainee quantity surveyor, and went on to take the college’s Foundation Degree in Quantity Surveying, gaining distinctions for both his construction and foundation course. Moving on to Nottingham Trent University, Joe was one of just three part-time students – two of whom were also from Derby College – to be awarded first class honours degrees. Joe said his Derby college lecturers were excellent and, he praised the depth and variety of the courses which “set me up” for the future.